NEW YORK, Nov. 17, 2016 – On the evening of its final day of programming, DOC NYC announced its 2016 award-winners. Concluding its seventh edition, the festival ran from November 10-17 at IFC Center, SVA Theatre and the Cinepolis Chelsea, and featured 111 feature-length documentaries including 19 world premieres, 19 U.S. premieres and 54 New York City premieres, along with 102 short films and 39 panels and masterclasses in the DOC NYC PRO professional development forum. “DOC NYC started two days after the election and found audiences grateful to take inspiration from films representing multiple perspectives,” said festival artistic director Thom Powers. 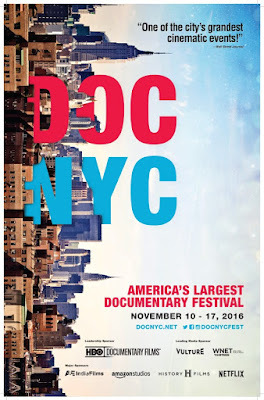 “The eight days of DOC NYC PRO panels enabled documentary professionals to process the opportunities and challenges ahead. In this time of uncertainty, we’ve never felt more invigorated about the vital role documentary plays in making sense of the world." Special Mention: Winter at Westbeth, directed by Rohan Spong, a spotlight on three longtime residents of the West Village's Westbeth Artists Housing. Special Mention: Bad Dog: A Penitentiary Story, directed by Sean McCoy, is about a black Labrador retriever named Pep, who in 1924 was convicted of murder and sentenced to life in prison at Philadelphia’s Eastern State Penitentiary. DOC NYC is made possible by Leadership Sponsor HBO Documentary Films; Major Sponsors A&E IndieFilms, Amazon Studios, History Films, Netflix; Supporting Sponsors Image Nation Abu Dhabi, Showtime Documentary Films, Sony; Leading Media Sponsors Vulture, WNET; Signature Sponsors Mayor's Office of Media and Entertainment, National Geographic, Participant Media, Sundance Now, Technicolor-PostWorks New York, The Yard.